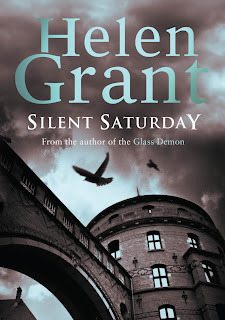 Silent Saturday is the first in a planned trilogy by Helen Grant, author of The Glass Demon, which I reviewed here, as well as a number of other acclaimed dark, mysterious YA thrillers. If you don’t generally consider yourself fan of YA fiction, don’t let the label put you off as there is nothing about Grant’s books that doesn’t stand up to the scrutiny of adult readers and if you hadn’t been told in advance that Silent Saturday was YA fiction, the only clue you’d find is the age of the protagonist. The plot is complex, the characters are often ambiguous and we see some of the action unfold from the point of view of a psychopathic murderer, with few holds barred. Above all, unlike far too many YA authors, Helen Grant never, ever patronises her intended audience. Seventeen-year-old Veerle lives on the outskirts of Brussels with her neurotic mother Claudine, who not only worries obsessively about Veerle’s safety but also relies on her as an interpreter. Bored with her suburban life and stifled by the over-protective Claudine, Veerle is understandably attracted to risky pursuits such as scaling practice walls at the local climbing centre. On her way home one winter night, she decides on impulse to investigate a flickering light in an abandoned building, and it’s there that she becomes involved with the Koekoeken, or Cuckoos, a secret society dedicated to breaking into empty properties. They don’t rob them, or vandalise them, or even squat in them – in fact, they generally perform a small maintenance task or improvement before they leave. What the Koekoeken have in common seems to a fascination with the very emptiness of the buildings they enter, from crumbling castles to the modern homes of holidaying millionaires or absent expats, and the thrill of the forbidden. The very concept of the Koekoeken would probably have been enough to hold my interest as a subject for a novel in itself, so fascinated was I by the idea, but in fact, Silent Saturday also sees Veerle and her old childhood friend Kris pitted against a possible serial killer and raises intriguing questions about Veerle’s past that Veerle herself is strangely unable to answer. The plot is gripping, the atmosphere chillingly creepy, the characters extremely well-drawn. Veerle herself, for instance, is a likeable but utterly believable 17-year-old on the cusp of adulthood, defiant without being stereotypically rebellious, shrewd without being boringly sensible, capable of falling for a good-looking boy without losing her mind over him, occasionally vulnerable but never in need of rescuing. Helen Grant also somehow manages to make everything that happens in Silent Saturday remarkably plausible. If you’ve read novels with teenage/child detectives battling adult criminals and thought ‘But why the hell haven’t they just told the police?’ you won’t find yourself similarly irritated here: while the decisions Veerle and Kris make are not always wise ones, there is a clear and credible logic to them. I loved the Brussels setting of Silent Saturday. Helen Grant builds a tremendous sense of sinister, foreboding atmosphere in the key scenes that makes this a genuinely chilling, tense read. The unique atmosphere of places – specifically empty places – is perfectly evoked with a fine-tuned eeriness. But there’s more than that: as a child, nothing fascinated me more than novels which revealed the casual everyday details of life in other European countries, and the Flemish setting of Silent Saturday is absolutely spot-on here. I am the sort of person who will never tire of visiting a foreign city and marvelling over small details like metro maps, the ranges of things sold by newsagents, TV commercials for mysterious sandwich spreads and weirdly unfamiliar fast-food chains. The very revelation that in Belgium, the church bells don’t ring on Easter Saturday because children are told that the bells have flown to Rome to collect the Easter eggs was frankly enough to make me hop up and down with joy. I realise it’s possibly odd to get so excited about other people’s Easter traditions or a reference to someone having a 'cellophane-wrapped sweet roll with jam in it' for breakfast, and maybe it’s just me, but anyway – Silent Saturday evokes that very feeling of slight unfamiliarity, that little insight into lives that differ in so many small but somehow significant details from our own. I also enjoyed the importance of language in the book, which comes partly from it being set in a country divided by its inhabitants’ mother tongues. Veerle’s French-speaking mother Claudine is isolated and frustrated by her inability to understand Flemish, making her a bitter outsider in her own native country, and the plot is kicked into action by Veerle losing her temper with a non-Flemish-speaking expat who criticises her English. As I mentioned at the start, Silent Saturday is book one of a planned trilogy, so although it does work as a standalone read, don’t expect all your questions to be answered on the final page. There’s plenty of intrigue left for books two and three – and I for one can’t wait. If you have a teenager, particularly a teenage daughter, get them hooked on the Forbidden Spaces trilogy now; if you haven’t, enjoy Silent Saturday for yourself.